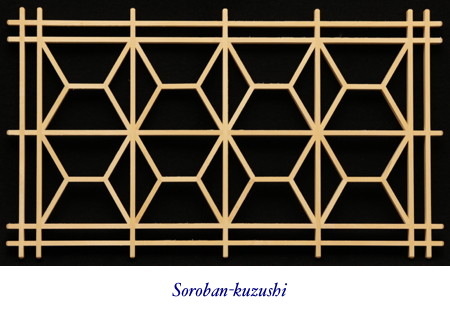 The soroban is a Japanese abacus, and the soroban family of kumiko patterns represents the beads in a soroban. Another name for this group of patterns is hishi-tsunagi (connection of diamonds). Kuzushi is from the verb kuzusu (崩す), which means, among other meanings, to change the shape of something, and here, because each pattern is contained in a single square, the shape of the beads have been changed slightly; i.e. they've been compressed. The soroban patterns would look very attractive as a band on the bottom of a shoji. 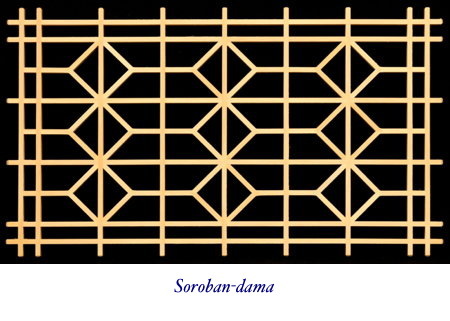 The soroban-dama pattern is the original soroban pattern, and features the beads of the abacus. Although similar to the soroban-kuzushi, the soroban-dama uses different joinery, and the beads of the soroban are connected through the jigumi kumiko.